Donald Fish is a graphic designer, illustrator, writer and cartoonist whose career spans 60 years — from 1945 to 2005. Fish has produced logotypes, packaging, illustrations and TV commercials as well as award-winning Australian poster designs. In 1951 Fish moved to London where he created posters for clients such as Cadbury’s and National Benzole, and record covers for Decca and Telefunken. The humour and drama of the European posters Fish found in Paris in the early 50s — particularly the work of Leupin and Savignac — fuelled his passion for the medium. ‘The most striking thing was the way they used ideas, because the idea is the lifeblood of a poster — the visual penetrates the eye, but the idea penetrates the mind,’ said Fish. Upon his return to Australia in 1954, Fish adopted the European-style poster — designing and writing arresting posters for national and international clients including AWA, the Commonwealth Bank, Johnson & Johnson, NSW Tourism, P&O, Peek Freans, Qantas, Resch’s, Schweppes, STC and Tooth’s Beer. 1955—60 saw his work appear in prestigious international design publications such as Graphis and Modern Publicity. At this time, Fish shared a studio with renowned Australian sculptor Robert Klippel, with whom he also collaborated on various industrial and packaging design ventures. In 1957, Gordon Andrews commissioned Fish to design two large murals for the Australian Department of Trade’s Food Fair in Köln, Germany. Fish and Andrews also formed part of the group of designers and architects who inaugurated the Sydney chapter of the Industrial Design Institute of Australia in 1958. Shortly after his return to London in 1961, the Australian Treasury invited Fish to submit designs for the new decimal currency of the 1960s, however he reluctantly declined the commission owing to his commitments in the UK. Back in Australia again in 1964, Fish co-founded the Kaleidoscope, a famously avant-garde antique shop in Sydney’s Woollahra, with wife Victoria and friend Grant Roberts. Its success was confirmed by its choice as the venue for Liza Minnelli’s Sydney-based television show. By 1970, Fish was Creative Director (Sydney, Melbourne, Adelaide) for the US agency, Compton International, winning a Bronze Lion at the Venice Film Festival for client British Airways with writer, John Flanagan. The same campaign also won a Silver Logie at the Chicago Film Institute in 1974. In 1976, Fish created standout poster campaigns for Harry M Miller’s productions of Jesus Christ Superstar and The Rocky Horror Show. The latter was awarded Poster of the Year by the Outdoor Advertising Association of Australia. Joining advertising agency Fountain Huie Fish in 1976 as Partner, Fish went on to create an international campaign for TIME magazine in 1981 that utilised its iconic front cover. This was supported by the release of promotional ‘TIME’ watches to media buyers. Other FHF clients included Club Med and Lüfthansa German Airlines. Upon the sale of the agency to Clemenger’s in 1987, Fish went on to design for Northwest Airlines (US), Pirelli and Citroën until his retirement in 2005. Don Fish’s other significant passion is music. He recently created a series of over 100 cartoons based on classical music themes that ran for 10 years in the ABC magazine, 24 Hours. Today he is expanding on this series with a view to publication, along with composing and writing. He lives in Sydney with his wife of many years, Victoria. 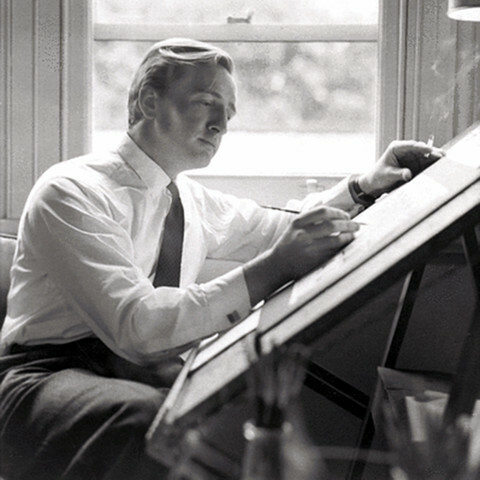 Donald Fish joined the Society of Designers for Industry in 1958 along with fellow designer Gordon Andrews. He later became an Associate of the Design Institute of Australia in 1972 and was recognised with a Fellowship in 1990. This text was sourced from DHub.